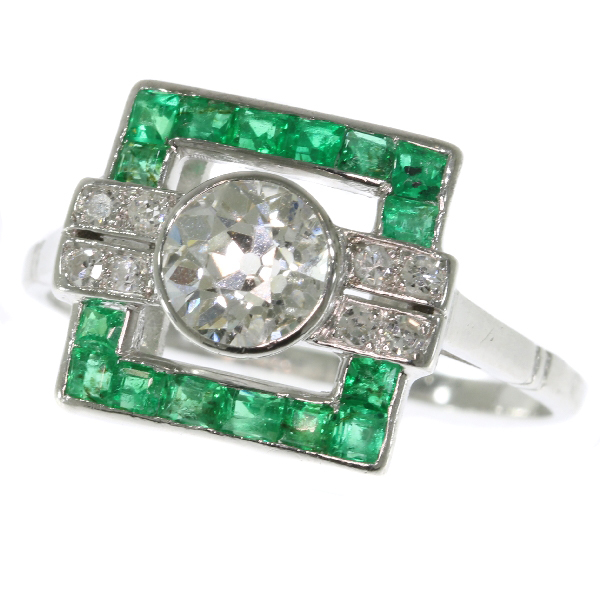 Strong yet sober design Art Deco ring with diamonds and emeralds: Description by Adin Antique Jewelry. This platinum engagement ring from 1920 oozes Art Deco sophistication through the gorgeous grand old European cut diamond centered in an openwork geometric design. Two lines of each four single brilliant cut diamonds form a bridge from the right and left of the central brilliance of pure white to a verdant green square outline of 16 carré cut emeralds. It's clear that this engagement ring offers the framework in which your future memories will mount and bridges will forever stand strong. Diamond(s): One old European cut diamond with an estimated weight of ± 0.75ct. (colour and clarity: H/I, vs/si). Eight single brilliant cut diamonds (also called 8/8) with an estimated weight of ± 0.16ct. (colour and clarity: H/I, vs/si).